Sydney Maiden - a landscape and figurative painter in oil and watercolour. Born in India in 1893 he served as an officer in the East Kent Regiment in both wars. 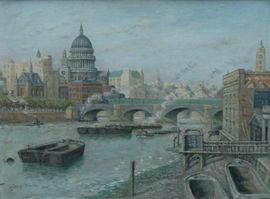 He exhibited in the 1930s at the Goupil Gallery, the New English Art Club and the Royal Academy.